Are you thinking about doing the Susan G. Komen event this coming October? If you need information about why you should walk, please read our blog in Sixes Living. If you’re on the fence about participating, maybe feeling overwhelmed and wondering how on earth one can walk 60 miles in 3 days, our friends at PLAE HARD(PH) and experienced 3-Day-er Gloria Avillar have lent us their expertise. Both parties agree that having the right gear is absolutely imperative. Think comfort and lightweight. This is a 20-mile-aday adventure, not your PTA moms walk around the park. As Gloria says “Train like you play,” meaning wear the exact outfit you plan on wearing during the walk – right down to the fanny pack, socks and hat. The pros at PH suggest body glides so that you avoid chafing and blisters. For Fuel, PH says what every woman trying to lose weight is told not to do: eat the carbs. Protein and carbs are essential for your body’s endurance. Why? Because when you ask your muscles to work hard, they need access to fast-burning energy, ie carbohydrates. Protein is involved in everything from muscle tissue repair to the repair of red blood cells, movement (muscle contraction), digestion, maintenance of the body’s water balance, carrying and regulating oxygen and so much more. By loading up on these two, your body will have the fuel it needs to take on those 60 miles. Training is necessary. There is truly no way to participate without training correctly for a walk of this distance. 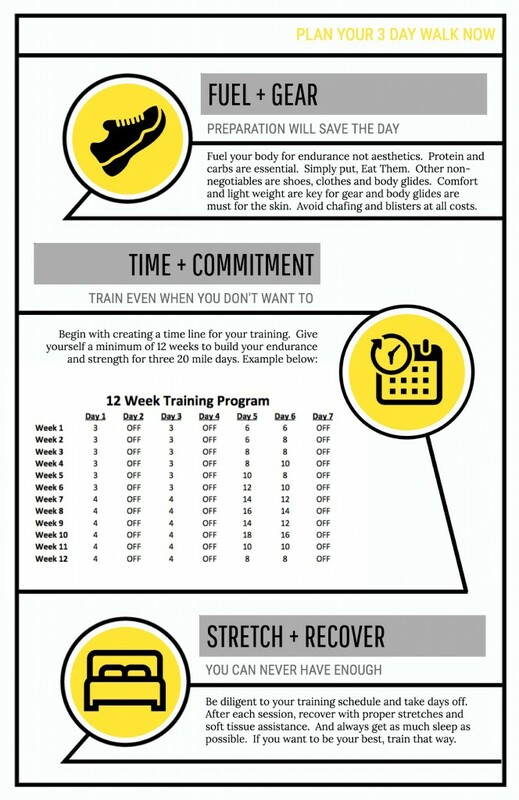 PH recommends creating a timeline for your training, with a minimum of 12 weeks to build your endurance. Gloria recommends not only training in different types of weather (let’s be honest y’all, you never know what you’re going to get in October) but train with friends even if they aren’t participating. You’ll motivate and be able to hold each other accountable. Really, you need to stretch out your muscles before and after your training session. Ask a trainer (such as Josh Keenum or Matt Hickmann at PLAE HARD) for the proper stretches for this type of training. Fair warning: while exercise gives you endorphins, it also gives you a good night’s sleep. Enjoy that! Get as much sleep as possible so that your body can recharge.